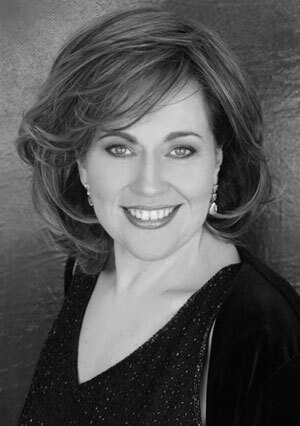 Soprano Susan Neves’ turn as Odabella on January 22 is her Seattle Opera debut, but she’s been with the company before, covering in the 1995 Ring. Since then, she’s made the switch from Wagner to Verdi and we ask her about her past experience with Attila, and find out why she thinks sword-wielding Odabella is secretly a big softie. Welcome back to Seattle Opera! You were last here covering Marilyn Zschau as Brünnhilde in our ’95 Ring. Have you been singing much Wagner since then? No, actually not. I was doing Wagner then because at that point that’s what the Met had offered me. But I’ve been singing all Italian opera, basically, since then. My specialty is Verdi; I’ve been singing Attila, Nabucco, Macbeth, Aida, and Un ballo in maschera. What is it about Verdi that appeals to you so much? Everything. I love the music, and I love the fact that Verdi gives the singer a beautiful line and makes it each individual character’s own creation. The orchestra does its oom-cha-cha and you have the beautiful melodies on top, so each artist gets to put in their own special sound—within the bounds of the musical line of course. I love it, I love it. 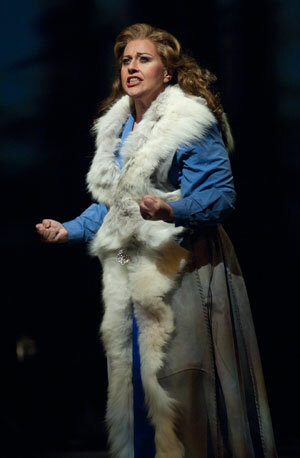 Odabella (Susan Neves in Seattle Opera's production of Attila) vows to use her father's sword to avenge his death. What about Attila in particular? There are some incredibly beautiful arias. Odabella’s second aria is like “Casta diva” from Norma, with these long beautiful phrases. The opera is relatively short, there are really only four principles, so we each get an aria or an aria and a half to show our stuff, and then we just sing duets or trios or quartets, and it’s just lovely. I’m thrilled I’m getting to do this here. You were involved with the Metropolitan Opera’s buzzed-about 2010 production of Attila. What was that experience like? I was covering Odabella, so I was there from Day 1, when it was created and then during the creation. It was extremely modern, and we’re doing a modern production here, too, but at the Met it was more about the set and the production then the actual characters and the music. We’ve heard a lot about the Met’s use of Prada-designed costumes. What was it like wearing couture on stage? It was odd, to say the least. Odabella looked like Marge Simpson. We had this gold costume for the banquet scene that kind of looked like a big Ferrero Rocher chocolate, but then we had this big long Marge Simpson wig that, instead of being blue, was grayish-blonde, but it looked exactly like her style. Here in Seattle, it’s a totally different look, a modern look. And I don’t mind doing things modern, but you become an opera singer so you can play dress up and wear pretty gowns ! [Laughs] But that’s not this production, and that’s fine. I’ll wear a pretty gown next time. Susan Neves as Odabella in Seattle Opera's production of Attila. Odabella, like Abigaille and Lady Macbeth, is reputed to be a fearsome role to sing. Do you find it very challenging? Well, her first aria is extremely difficult; it’s a coloratura showpiece, and you walk out and have got to show what you’ve got in the first 10 minutes on stage. But my specialty is Nabucco, and Abigaille is a much longer part and much more difficult. So, I love singing Odabella because once I get the first aria over with, I can just have fun and enjoy singing the rest of it. We see Odabella in many moods: in the opening she’s proud and ferocious, then in her aria she’s sad and nostalgic, then religious, then devious, and finally driven to desperation. Which side of her character comes easiest to you? The loving side of Odabella, which is what every reaction she has in the whole opera is based on—love for either her country, her father, or her boyfriend. Her anger that her father has been killed is because she loves her father. She gets upset with Foresto because she loves him and he thinks she’s betrayed him. At the end, even before she kills Attila, she says, “Father, I’m making this sacrifice for you.” Whereas, for example, Abigaille in Nabucco is very conniving and she’s looking out for herself. But in Odabella, I don’t see that. She’s not a mean person, and I don’t think she’s a violent person at all. What other roles have you sung where you get to kill someone? Well, I do sing Turandot. So I’ve had several tenors who have not given me the right answers and who have therefore lost their heads. I’ve sung Tosca and she kills Scarpia. More often, I’ve killed myself, in Il trovatore and Norma. But I don’t play murderesses too much. 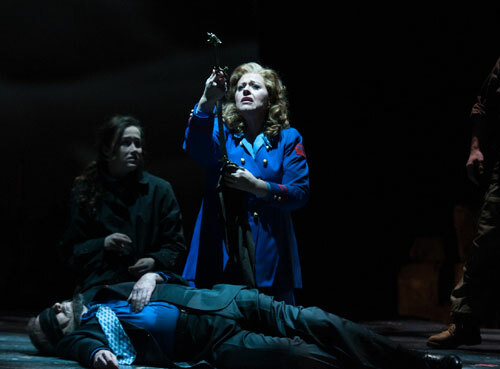 Odabella (Susan Neves) takes her revenge on Attila (Mika Kares) in this scene from Seattle Opera's production of Attila. What about other roles where you’ve wielded a sword? Abigaille. And when I did Valkyries, we didn’t so much carry swords, but we had spears and shields. But I’ve carried lots of swords as Abigaille. In one of our staging rehearsals here for Attila, I was waving around the sword and director Bernard Uzan said, “Uh uh uh! 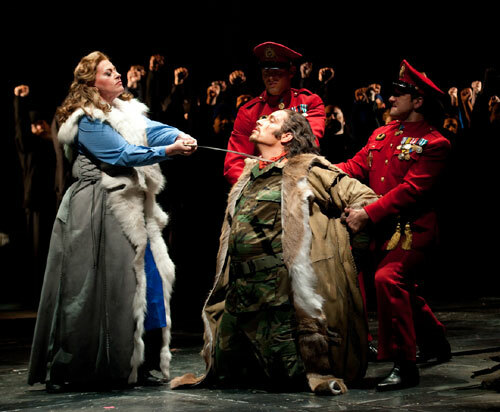 This is not Nabucco, sweetie!” Because the Abigaille and warrior woman in me came out. But Odabella is not, I think, a warrior woman, so I’ve got to watch it. I like to play her softer. I want the feminine part to come out. Everything about her character is the fact that she’s a woman and she loves deeply, and I really like that.